KTM's much awaited Duke 390 is finally here.as we already revealed you a couple of weeks back through one of the dealers in Delhi-NCR, about the launch date in India as 25th June 2013. The KTM Duke 390 is be the first 350cc+ bike for the Austrian bikemaker in India. The bike is priced around INR 1.80 Lac, ex-showroom price, Pune thanks to the heavy localization which will give other bikes in similar category a run for their money. 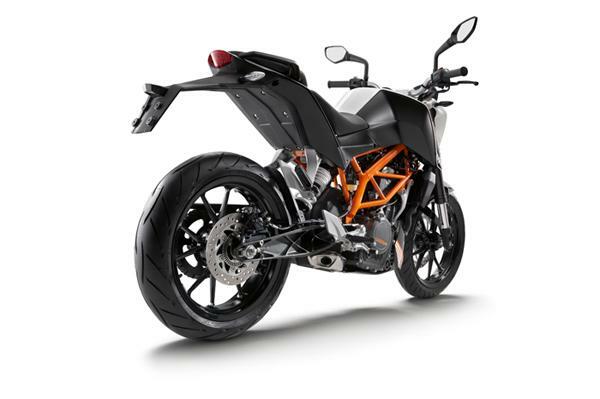 The 390 Duke shows off the same sporty KTM 'ready to race' DNA as on the 200, being a flamboyant, edgy and aggressive looking machine, with an unashamedly modern air. Watch out the LIVE unveiling of KTM Duke 390 here. A significant feature is the inclusion of Bosch's 9M ABS option. The sensors at the front and rear end will be connected to independent ECU for ABS functioning. The rider also has an option of switching off the ABS option. All parts have been lightened with excess material shaved off, helping to keep the bike light at an impressive 139kg. The 390 front mudguard is sporty and stubby, while both wheels look really smart in orange. Its powerful headlight sits in a futuristic looking bikini fairing. The near flat handlebar is tapered alloy, while the instruments remain a compact, digital readout that sadly still isn't the most readable in the business. Powering the Duke 390 is a 4 stroke water cooled 375 cc single cylinder engine that delivers power output of 43.5 horses at peak torque figure of 35 N-m. 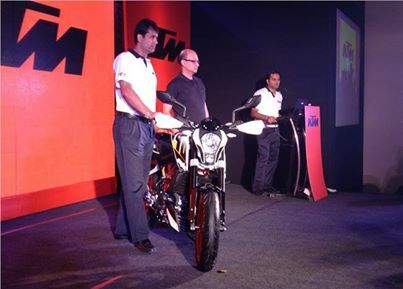 The bike is equipped with 6 speed manual gearbox similar to Duke 200. The 375cc bikes's transmission shares lot of components from its younger sibling Duke 200 but with different gear ratios. The Duke 390 also boasts of forged piston and chrome plated cylinder. 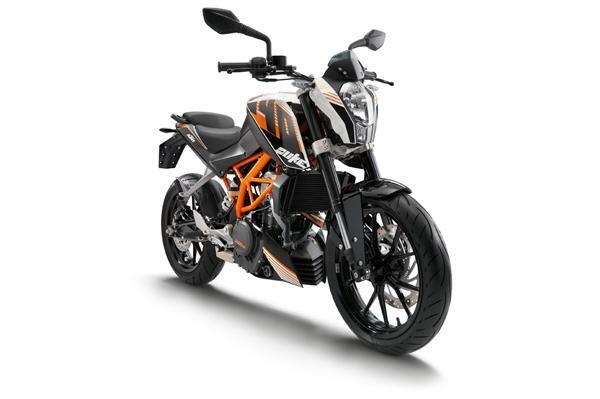 Visually, the bike looks similar to Duke 125 and Duke 200 however the changes include orange colored alloy wheels, and orange paint on trellis frame. Stay tuned for more information.